Birds of prey are excellent environmental indicators and flagship species for natural-resource conservation. Increasing of Armenian agriculture and other blanches of industry can have a negative impact to environment. To track the possible influence of industry to our nature we would like to start monitoring of subpopulations of model species in some regions of Armenia. As a species to be monitored we have chosen Long-legged Buzzard (Buteo rufinus) because it is most common rodent-eating bird that breeds in whole Armenia. We have conducted mapping of nests, and survey of reproductive success, as well as we have investigated their feeding, reproductive success and analyze collected data on GIS Arc View. The project includes education of local inhabitants about importance of rodent-eating raptors for agriculture and nature ecosystems. During the project, those students, who have completed BITC courses in Acopian Center for the Environment, have been trained in the field data collection. Two of the students, Grigor Janoyan and Tsovinar Hovanisyan have completed their Bachelor and Master’s degrees on the topic. Long-legged Buzzard Buteo rufinus, outskirts of Gusana village, Shirak region of Armenia. 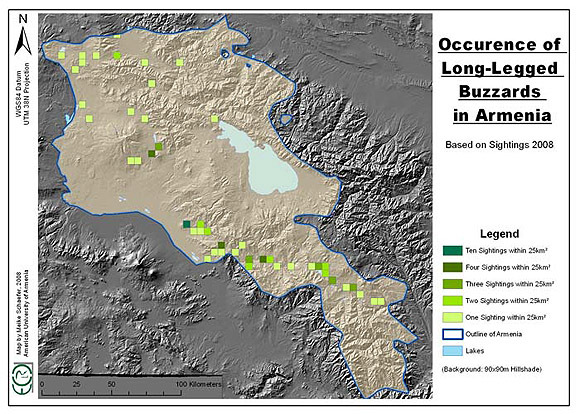 Our study shows that the density of Long-legged Buzzard varies in different parts of Armenia. For example, the mean distance between the nests (nearest neighbor distance) is 1.98±0,19km (n=10) in Vedi district, while in Vayots Dzor region the mean distance is 3.04±0.3km (n=5); t=3.14, p=0.008. 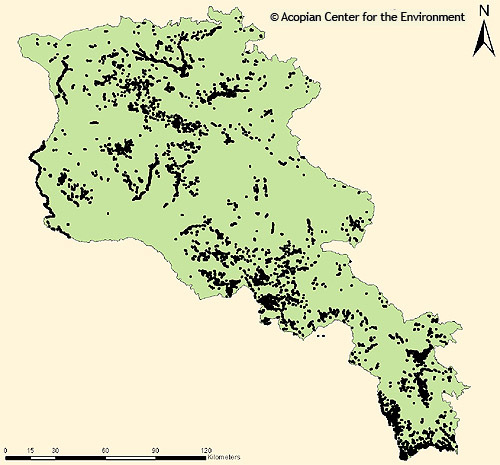 The difference in density seems correlated with steepness of surrounding area, since the Vedi district is generally more flat, than the Vayots Dzor region, which indicates that probably Long-legged Buzzards prefer habitats with less steepness of slopes. Most probably it depends on hunting technique of Long-legged Buzzard, which catches the prey on the ground dropping down from 5-10m. The other limiting factor is cliff availability, since in Armenia Long-legged Buzzards breed only on cliffs. Although LLB does not show dependence on the height of the cliffs and can place the nest on the height from 2 to 30m, it does not breed on trees, like in some parts of its area in Siberia. The concluding results of the study were presented as a poster on the International Raptor Conference in autumn 2009 in Switzerland. 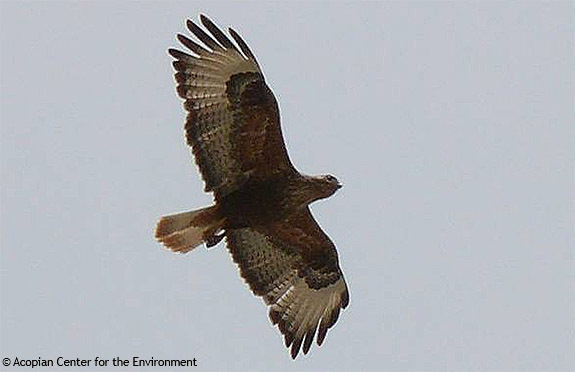 We continue monitoring and conservation of Long-legged Buzzards in Armenia. In the frames of the study a GIS shape file was developed, covering all cliffs and rocky massifs of the entire territory of Armenia. Hovanisyan, T., Janoyan, G., Schaefer, M., Aghababyan, K.
// 7th Conference of the European Ornithologists' Union 2009. Zurich, Switzerland, 21-26 Aug 2009.